This week a reader asked our advice about transferring his USB measurement equipment to Windows 8. If you've had any problems with USB systems under the latest version of Windows, read on below. We also have our regular Excel corner, this month with why and how to declare variables; and our Windmill question and answer section on using an energy meter with Modbus and RS485. Thanks very much for subscribing, and if you wish to download our free data acquisition software you may do so. * Excel Corner: Why Declare Variables? With the release of Windows 8, Microsoft imposes more restrictions on what it will let you install. The casualties include legitimate USB device drivers. If Windows 8 is not recognising your USB instruments, you need to disable Windows driver enforcement before installing your USB drivers. This involves restarting your computer three times. Make sure then that you have closed any open programs before proceeding. Tell Windows you are about to temporarily change your computer settings. Move your mouse to the bottom right of your screen. Select the Settings gear and choose Change PC Settings (at the bottom of the menu). 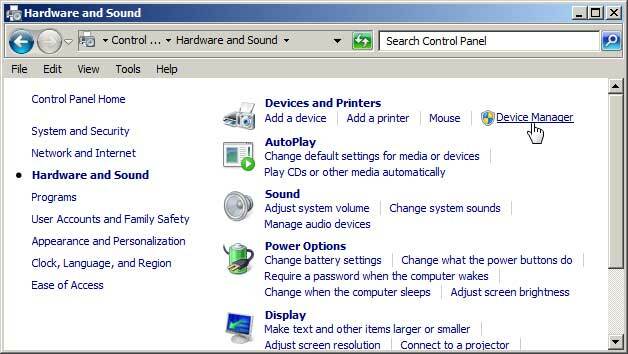 In the Change PC Settings menu, choose General. Scroll down to Advanced startup and click the Restart now button. Your computer will reboot. When the computer restarts you'll be asked to choose an option. From the menu that appears choose Advanced Options followed by Startup Settings. From the Startup Settings screen, click the Restart button. You computer will again reboot. At the Startup Settings screen, press either the 7 or F7 key on your keyboard to disable driver signature enforcement. Your computer will again restart. You can now install your USB drivers. Open Control Panel and select the Hardware and Sound option. Under "Other Devices" you will see your USB data acquisition hardware with a yellow warning sign. Right click the device. The USB Properties box appears. Select the Driver tab and choose the Update Driver button. Browse for your driver. For a Windmill system the driver is in your Windmill folder, for example c:\Windmill Software\Windmill\Drivers64\. Click Next. Windows will ask you confirm that you want to "install this driver software anyway". You are now ready to use your USB device. When you next restart your PC, Windows' driver enforcement will be restored. Windows doesn't allow you to permanently turn it off. I've connected a USB-RS485 port. In Comdebug, I'm trying to Edit the message. The instrument manual says that 03H reads multiple register from BTU meter, 06H writes single register from BTU meter and 10H writes multiple register from BTU meter. I input Bytes1, 2 and 3 as 0,3,H. Bytes 4,5,6 as 0,6,H and Bytes 7,8,9 as 10H. The status gives all COM input lines as false and COM output lines as both true. But there is no reply from the instrument. What is wrong? Excel Corner: Why Declare Variables? When we write Excel macros, we use variables to store values in Excel's memory. Although not essential, it is good practice to declare the type of variables you are using. Why? It makes debugging easier, because the VBA Editor will then be able to highlight errors it would otherwise miss. You'll have access to intellisense. This shows you which properties and methods you can use with your type of variable. In the Visual Basic Editor just type the name of the variable followed by a dot. To force yourself to explicitly dimension all variables, put the line "Option Explicit" at the top of your code window. Excel will now pick up any mis-spelled variables. For example, if you are using a variable called MyData, and you later spell it MyDate, Excel will flag this as an error. Without using Option Explicit, Excel would create a new variable called MyDate and initialise it to 0 or an empty string. A variable name must contain only letters, numbers and underscores, and may not start with a number. Some people like to start a variable name with a letter which represents their data-type. For example, i for integer or str for string. This makes it clear with which type of variable you are dealing. Some common prefixes for variables are given below. You would think that that would declare a, b and c as integers. Actually, only c is declared an interger and a and b are "variant". The Variant data type can hold any sort of data. It has a numeric storage size of 16 bytes and a string storage size of 22 bytes plus the length of the string. All undeclared variables are Variants. Integer - Whole numbers, for example 1 and -300. Floating Point - A number which can contain a fractional part, a real number. For example, 1.0 and -500.5. It is called floating point because there is no fixed number of digits before or after the decimal point. For more on writing macros in Excel see our Excel tips page at https://www.windmill.co.uk/excel/excel-tips.html or contact [email protected]. By embedding carbon nanotubes into plants, MIT researchers have made them detect the gas nitric oxide. The plants fluoresce in the presence of the gas, functioning as a photonic chemical sensor. Scientists are attaching satellite transmitters, depth sensors and small video cameras to large tiger sharks in Australia. They can track their movements (when they surface) and see exactly what they are doing. According to a report by Markets and Markets, the total revenue of global smart sensor market is expected to grow at an estimated CAGR of 36.25% from 2013 to 2020. They expect it reach $10.46 billion in 2020 from $650 million in 2012. As a thank you for subscribing we offer you the ComDebug data logging and Com port trouble-shooting software for free. Log data over RS232, RS422, RS485 or Modbus. Also included is a free month's trial of the Windmill 7 logging, charting and control programs.